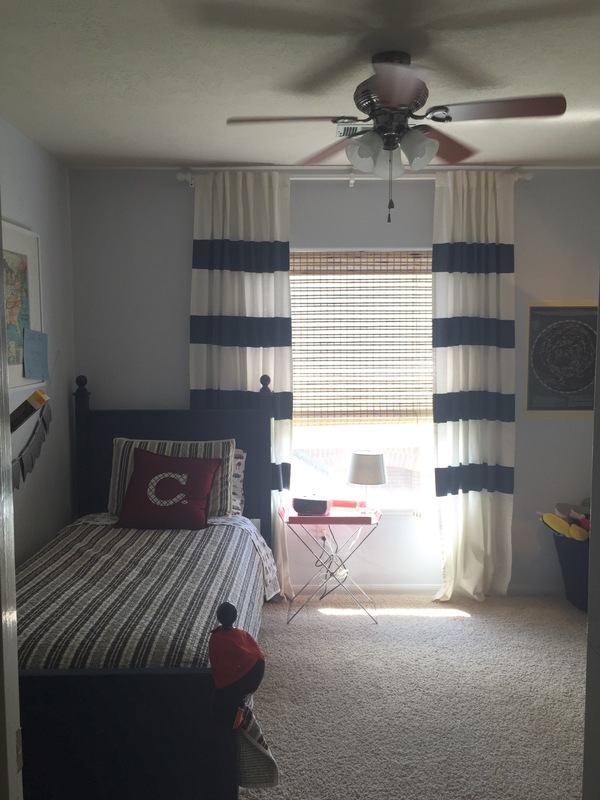 Today I’m talking about my oldest son’s room. 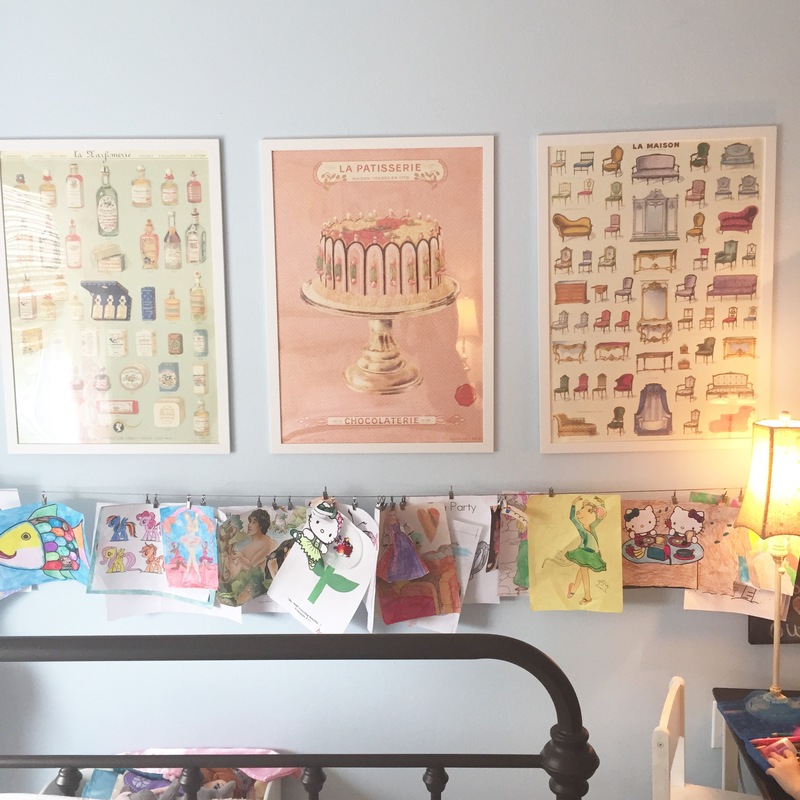 A lot of the things hanging on this little gallery wall I’ve had in his room since he was born. You can see his nursery in our old house here. I noticed the other day that the silhouette looks a lot more like his little brother now though than it looks like him! Speaking of that little brother, here he is now, adding to the chalk wall… and maybe stealing from the sticker collection. I didn’t really decorate this room with a “color scheme” in mind. 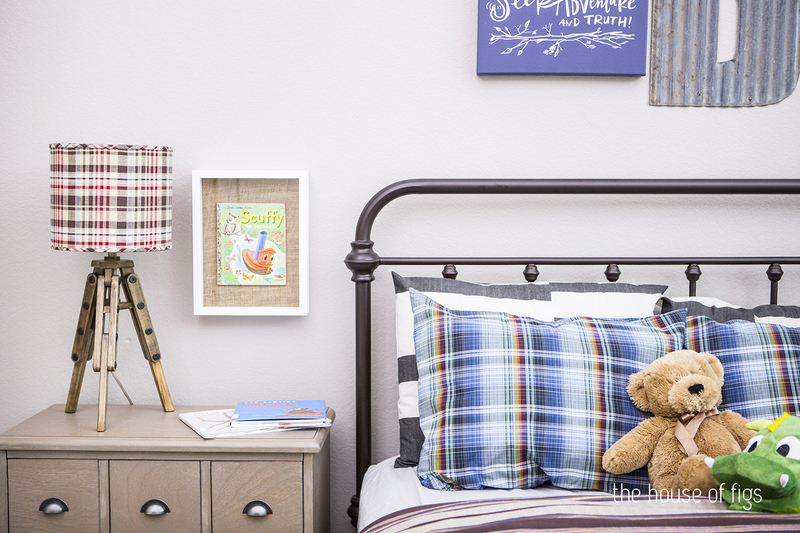 For kids rooms especially, I love for their toys and pictures and stuffed animals to dictate the color and the feeling of the room, so I stick to mostly neutral furniture and bedding. I’ve let my son take the lead on a lot of the “decor” in this room- the legos, the stickers, the trophies, the Skylanders poster you see above. (Similarly, if you’re not sure what Skylanders are, find a 7 year old to ask.) I love that this room is all him. 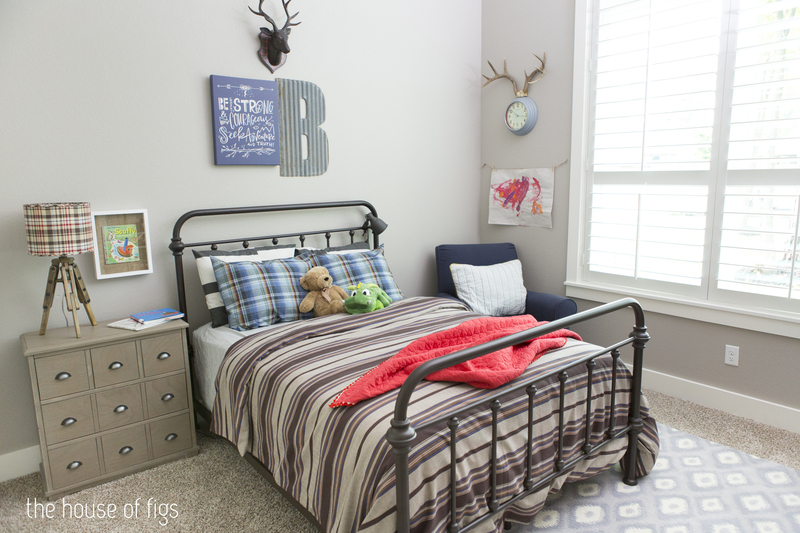 There are a few elements though that I always make sure to include, even in a kids room. 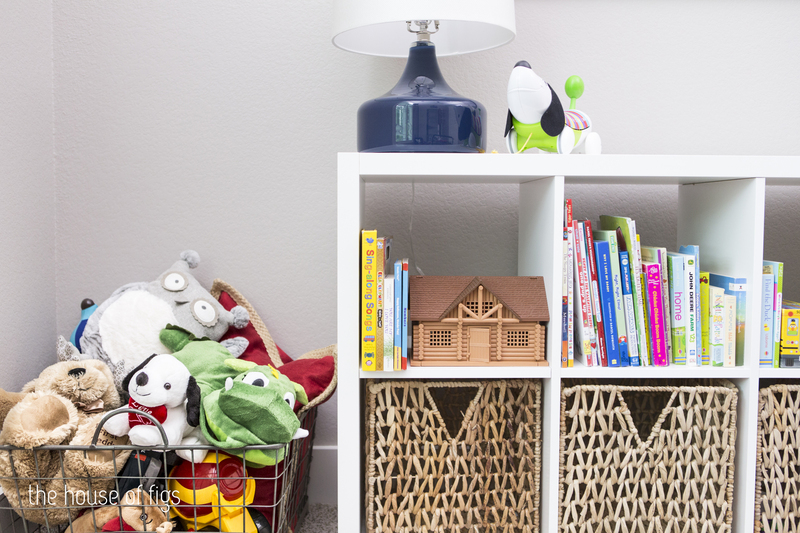 It might seem obvious, but storage is key. 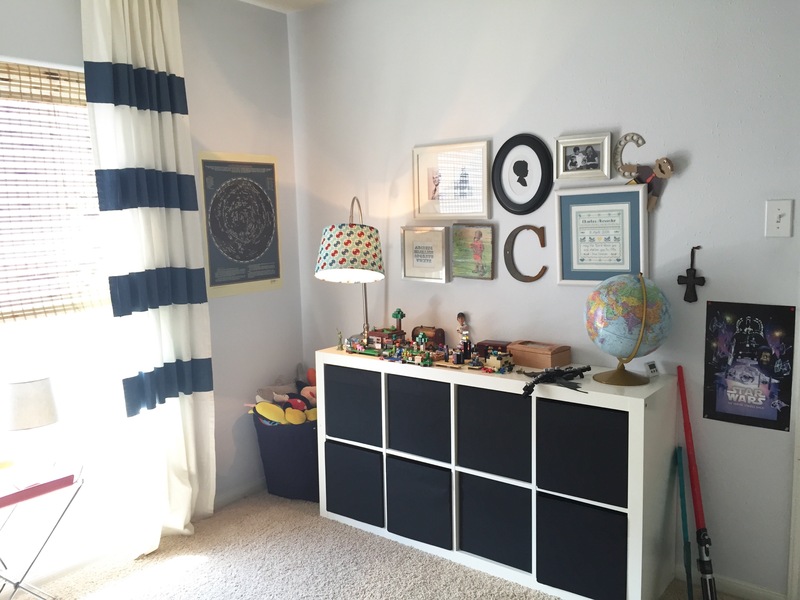 My favorite Ikea Kallax is up there, holding lots of treasures, rock collections, random papers, superheroes, and books. Another essential is a grown up sized lamp. He does have a small reading light on his bedside table, but on the Kallax is a big lamp I found at HomeGoods. I covered the shade with fabric to brighten it up, but its still a large scale lamp. 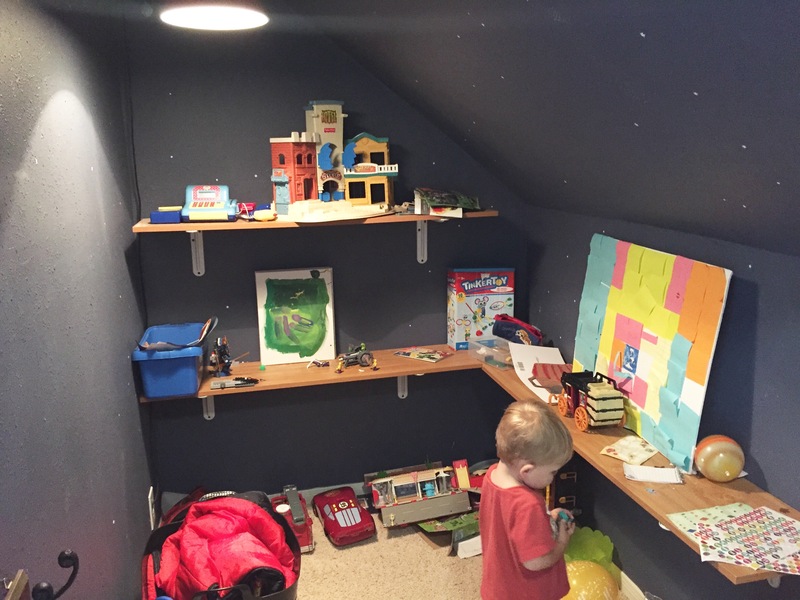 Kids need good lighting too! I love coming up there and finding him all cozy playing or reading without the overhead light on, only using his lamps. I love being in a room like that! He enjoys it too. 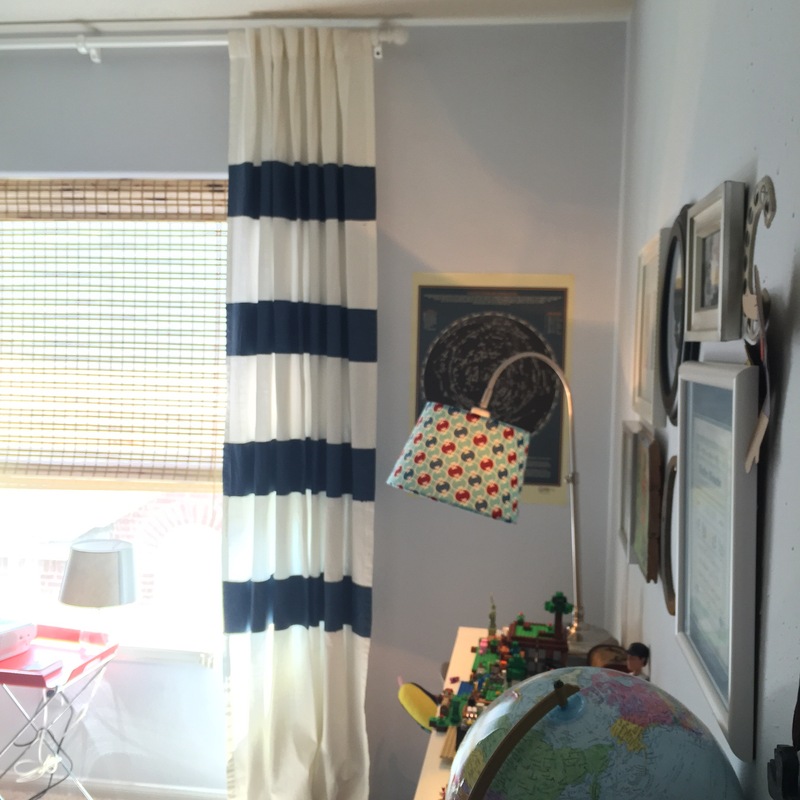 Another element I chose for this room: real curtains and window treatments. Not a tiny valanace- but long drapes, and a bamboo shade for texture. It gives it the same feeling as the rest of our house. And lastly, I think its important to buy real furniture. He does have a twin bed but it is real wood and we found it at a consignment shop years ago. Even if it gets passed down to little brother eventually, its still a real piece of furniture that I can always use, repaint, etc- not a plasticky kid’s theme bed that will eventually end up in yard sale pile. He also has a big dresser in his closet. Obviously if the budget doesn’t allow, it just doesn’t allow and I’m not suggesting you go into debt over this. But maybe if you can save up for the real piece of furniture, or find something to refinish at a yard sale, consignment store, etc, I would say that’s the way to go. 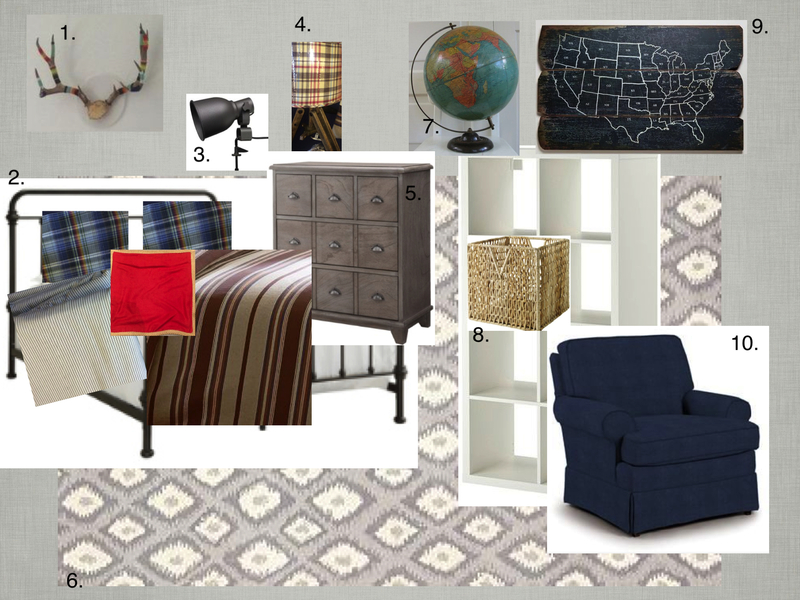 So I treat it like I would any other room- real furniture, big lamps, great window treatments, good storage. And then I let him have at it with the details. Thanks so much for reading! 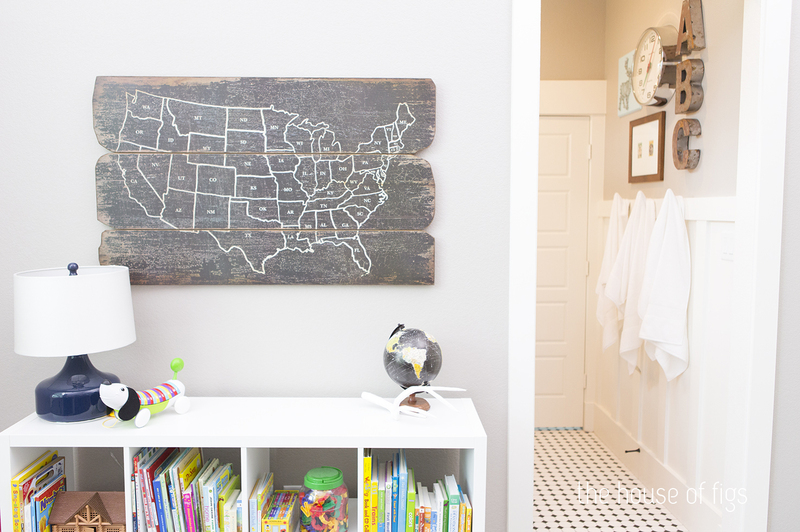 Have you found any ways to let your kid’s decorate their own rooms? In a way that you still can enjoy as well? 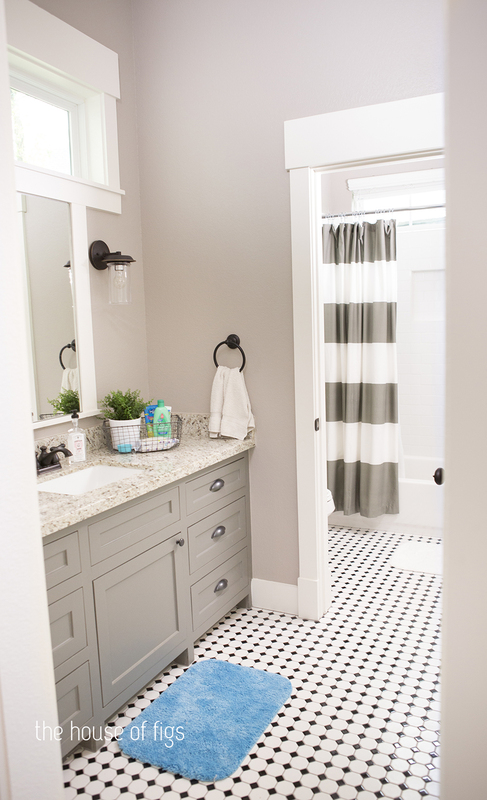 The cabinetry is painted Benjamin Moore’s Chelsea Gray and the walls are my favorite Silver Dollar by Olympic. The shower curtain is from West Elm. The ABC letters were found in Round Top. 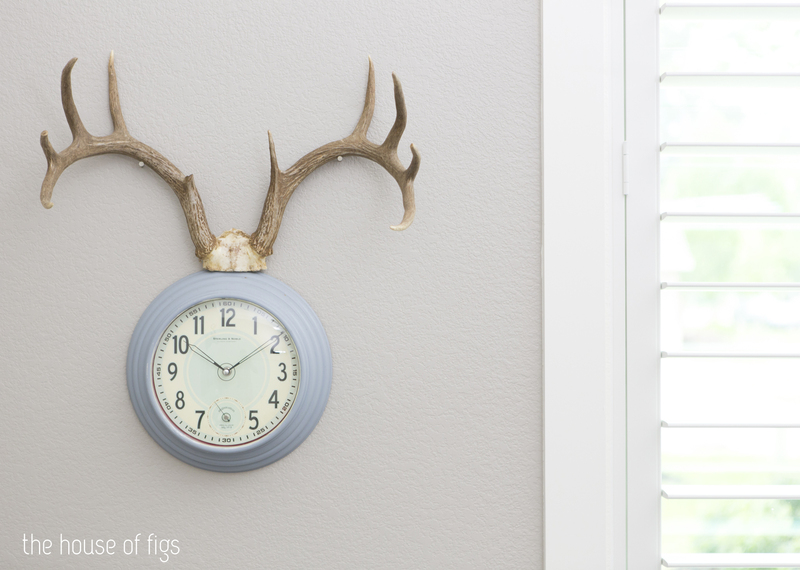 The big clock is from Pottery Barn. 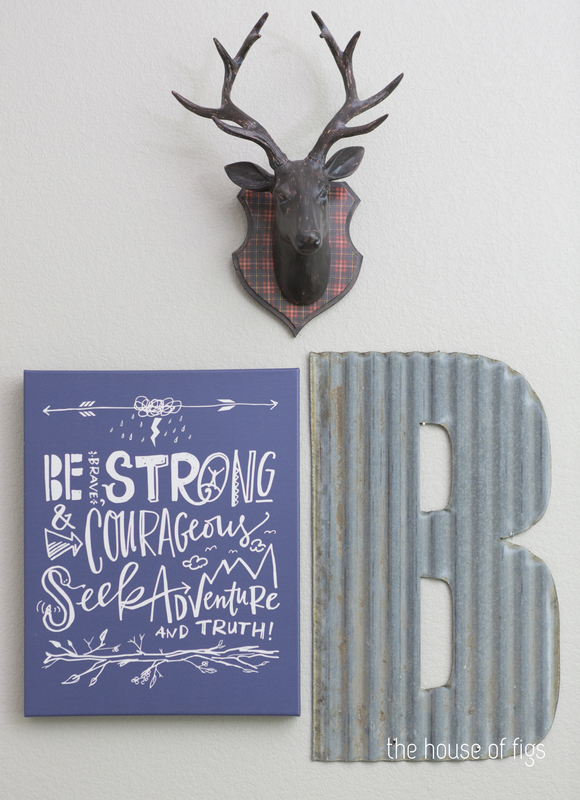 The deer art was found at HomeGoods by my client- as well as the other frame which contains two vintage baseball cards! She had a mat cut to fit. 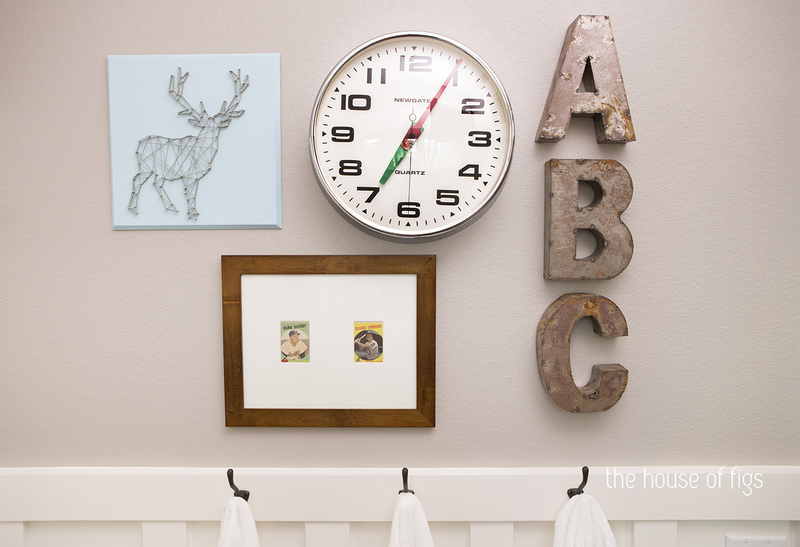 Isn’t that just so cute for a boy’s room or bathroom? 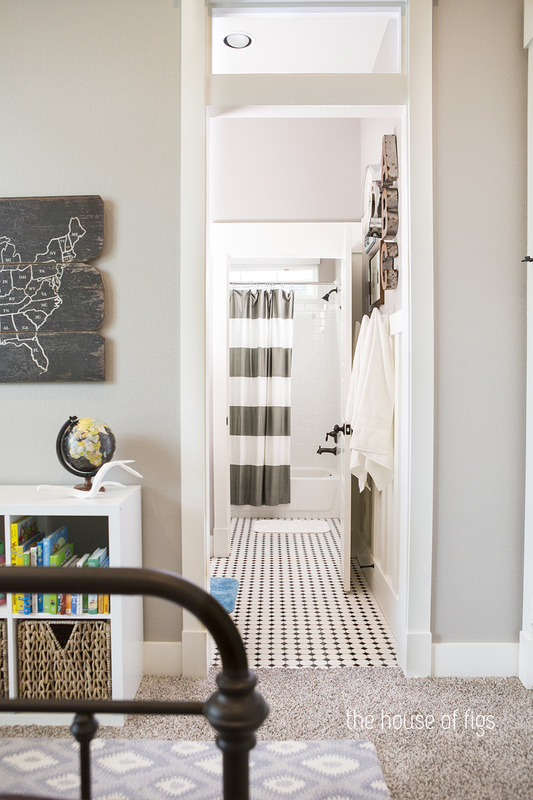 This is actually a jack and jill bathroom, so the room with the tub and shower opens to another room with an identical sink area that is off a guest room. 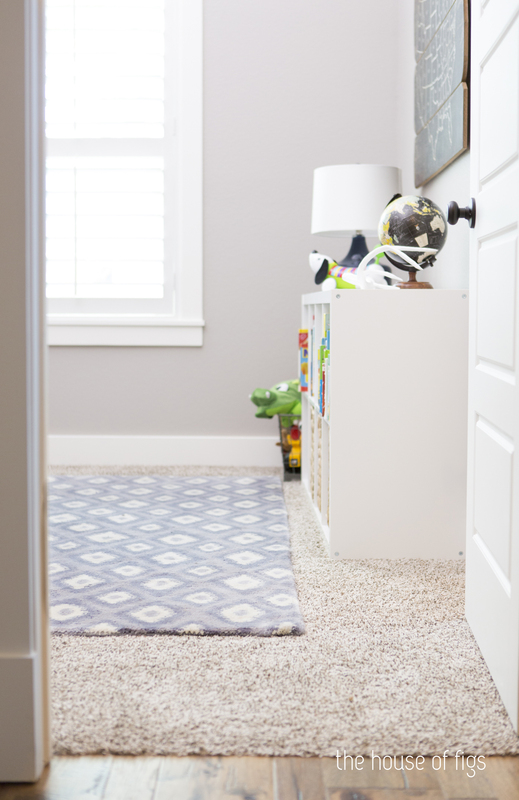 We’ll tour that room one day… click here for more of the Montgomery House tour if you’re new here! Hi, if you’re here from Honey We’re Home, welcome! Thanks so much for stopping by! 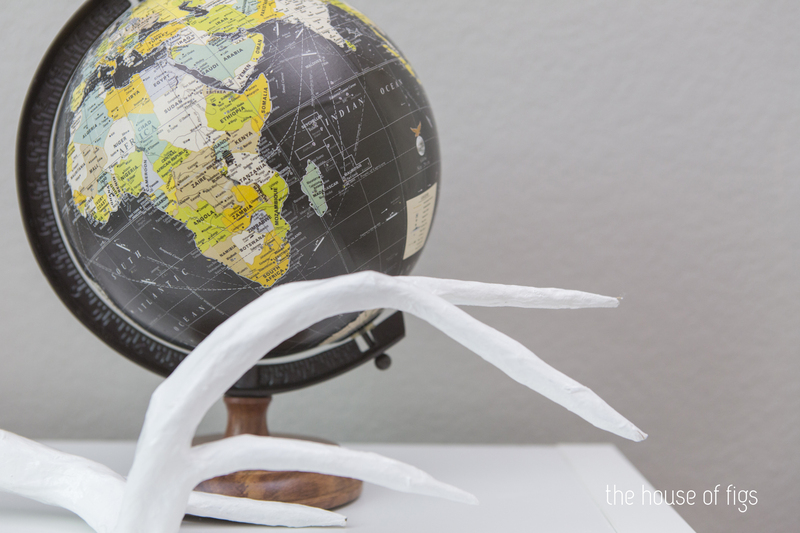 If you’d like to see the post about my kitchen for more details, click here! The title of this post kind of says it all. Norah is an artist. 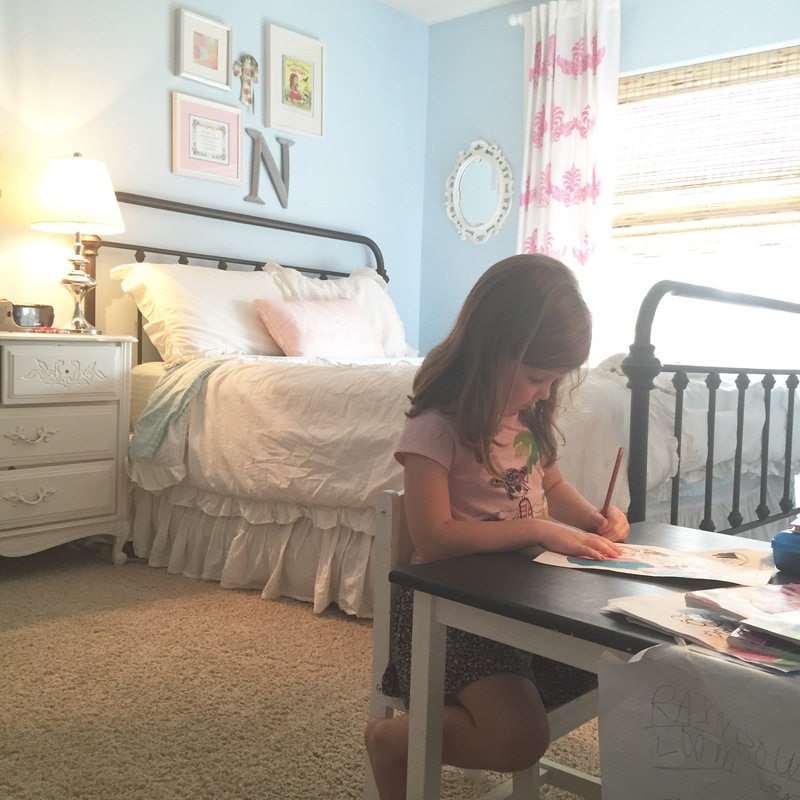 She spends every free moment coloring (and takes breaks for dancing). She colors so much she has a permanent blister on one of her fingers. 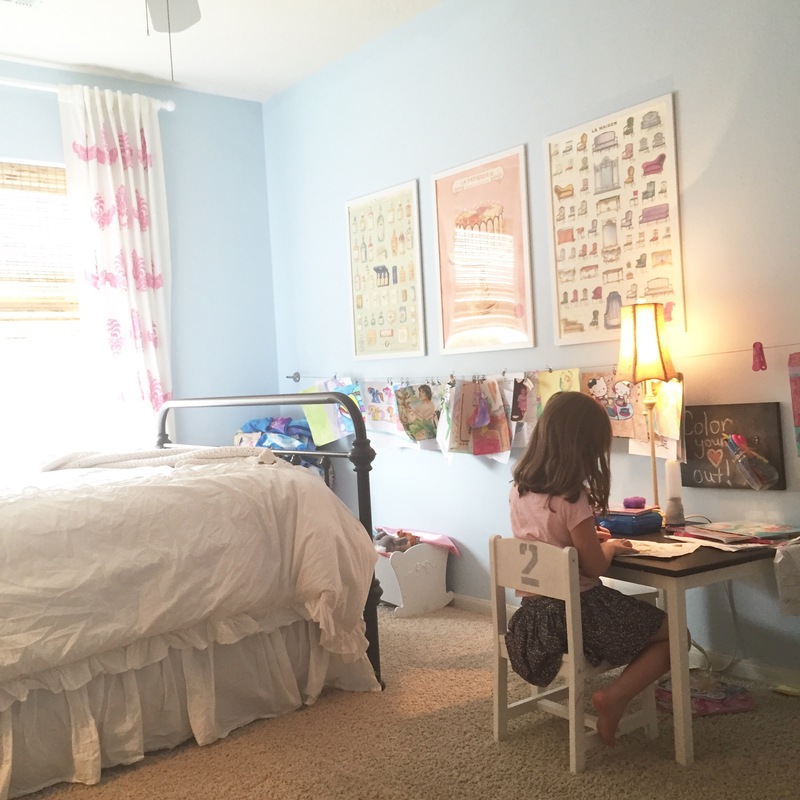 Her room could be a chaotic mess of paper after unfinished paper. Some are from coloring books, sometimes its just a piece of construction paper or white printer paper. Inspiration strikes her anywhere, anytime. She gets this talent from her Daddy and for a while I did not know how to handle her chaotic creativity. I want to teacher her to clean up her room of course but I also don’t want her to have to throw away every piece of art that she hasn’t finished yet. 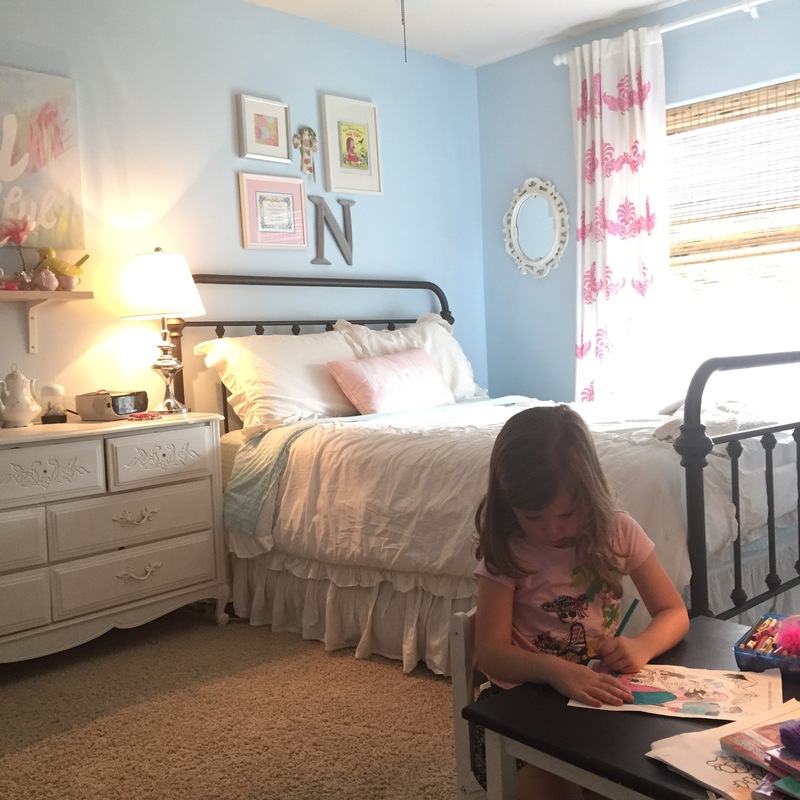 But we (sort of) have a system and we made room for this little desk and lamp in her room so there’s an order to it now. That’s enough to satisfy me. These three prints are actually pieces of wrapping paper from The Paper Source. 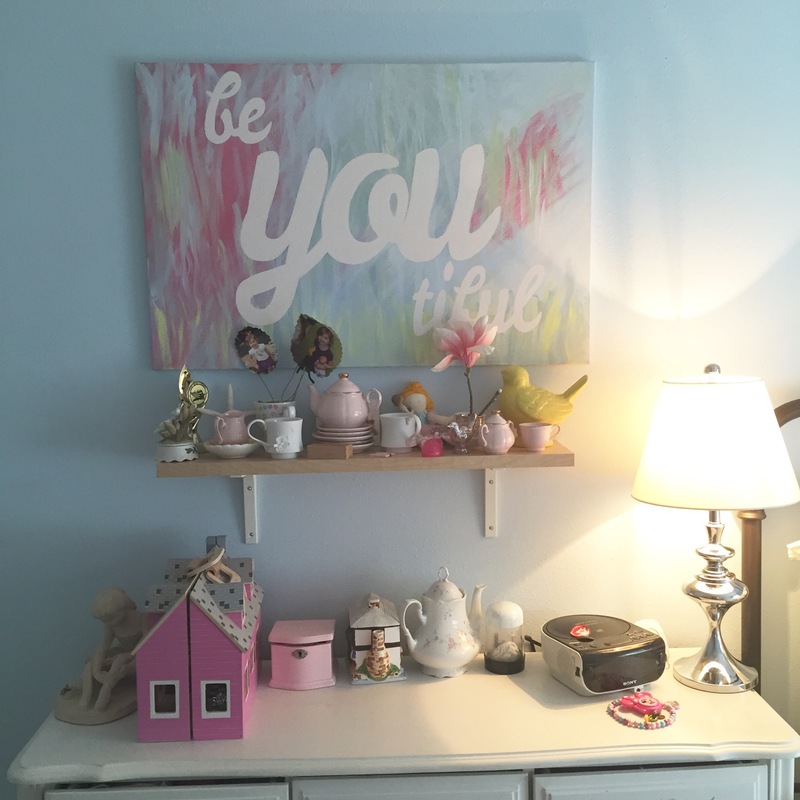 That store is one of my favorite resources for large and inexpensive wall art. At $4-$7 a sheet, it may be pricey for wrapping paper, but for a large print to hang on the wall I think that’s pretty good!! I have several of their map papers framed as well throughout my home. 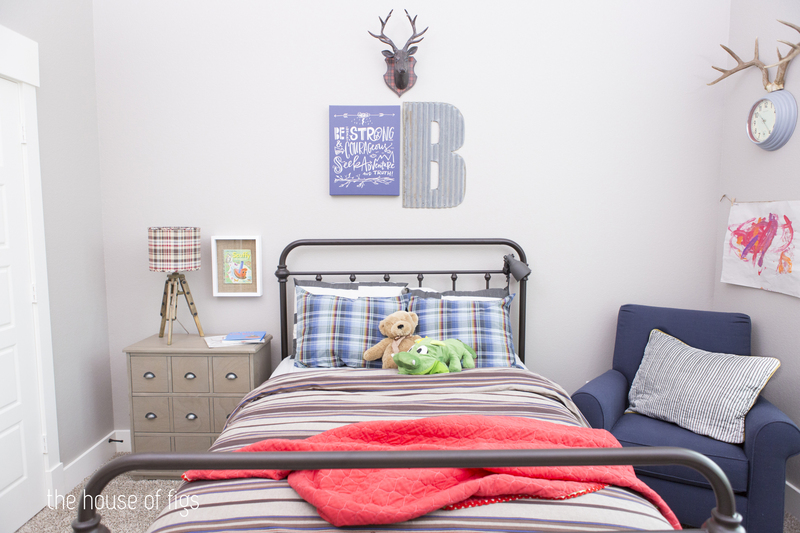 The frames are inexpensive ones from Ikea that are perfect for a kids’ room. 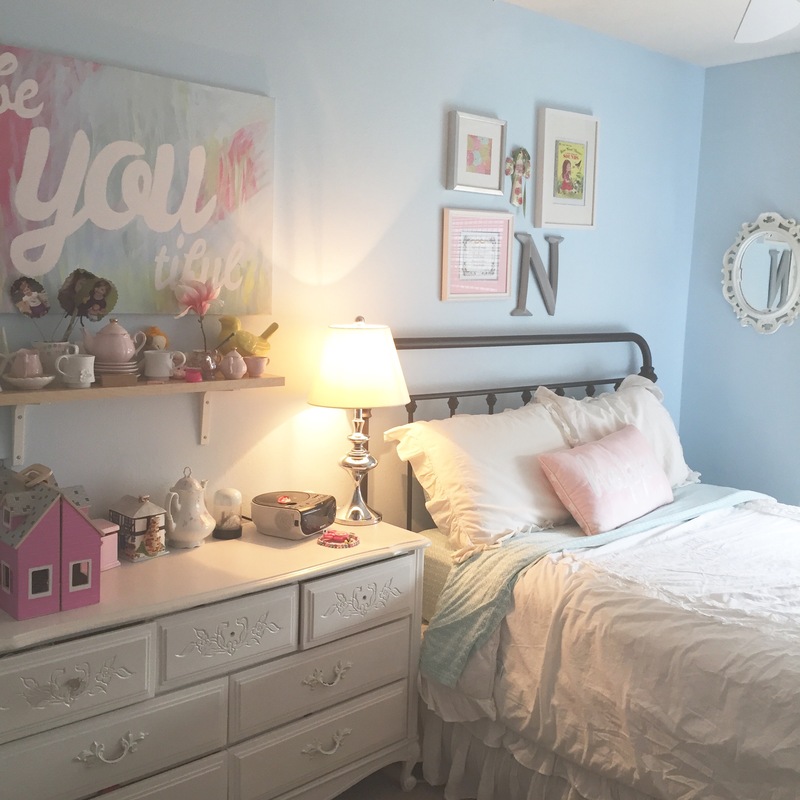 She is a girly girl to the max and when we first moved here, she was just barely two so I painted this room blue before she even had a say in it. I think I just had this fear that the whole thing would be pink and purple overload. 😉 I think I was right. The curtains are again my favorite Ikea Ritvas that I stenciled with fabric paint back when I was about 8 months pregnant with her. 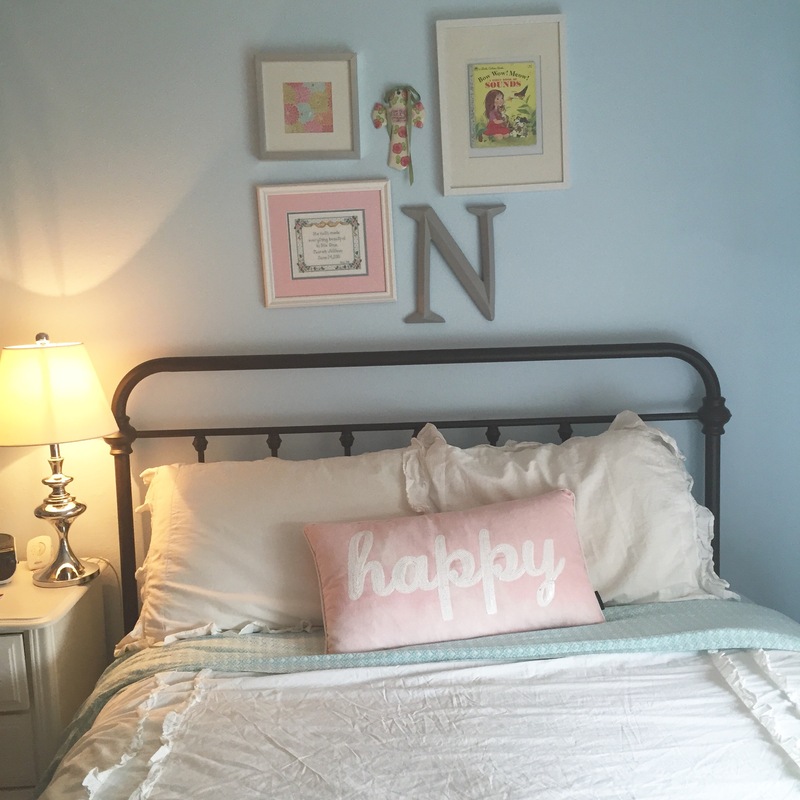 You can see them hanging in her nursery here. Though I am not usually a DIYer, I tend to take on big projects like that when I am gigantic and pregnant and nesting like crazy, haha!